Happy Valentine’s Day! 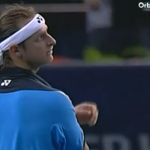 Here are some of my favorite tennis videos that I hope will brighten your day. The 1990 French Open final should be, at the very least, the reason why I love tennis. Why? Andrés Gómez won the match, and he comes from the same country I do, that little South American piece of land on the Equator that someone named “Ecuador” in an amazing display of creativity. The likelihood of an Ecuadorian winning a Grand Slam in singles is very small. After all, most people in my country grow up loving a rather different sport: soccer. I love tennis, so I should love what Gómez did. 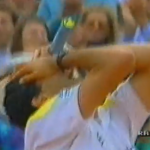 Every shot of that final against Agassi should be ingrained in my memory. An Ecuadorian won a Grand Slam! How crazy is that? There’s one small problem, though: on the biggest day for Ecuadorian tennis, June 10th, 1990, I was seven years old. After setting the table for so long on Tuesday, let’s now dive into the second set of this Masters Cup semifinal. You know, the one with the historic tiebreaker. Here we go. 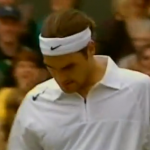 As Roger Federer starts his quest for his seventh World Tour Finals title, it occurred to me that this could be a good time to revisit a match I had never watched, but heard plenty about: Federer’s semifinal encounter with Marat Safin at the 2004 Masters Cup, held that year in Houston, Texas.